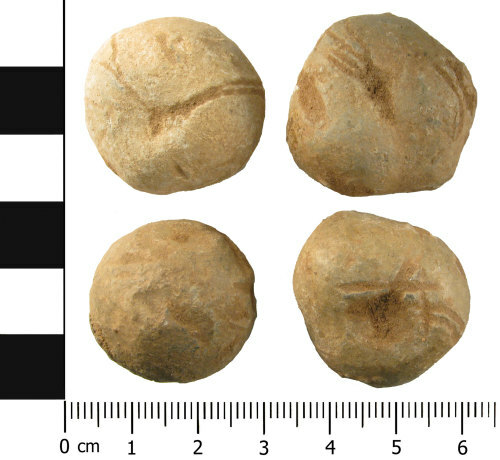 Four (4) complete cast spherical lead alloy probable Shot, of Post Medieval dating, circa AD 1600-1800. The shot measures 26.88 mm in diameter and 19.37 mm thick. It weighs 69.8 grams. This has a double groove on one side. The shot measures 26.50 mm in diameter and 19.30 mm thick. It weighs 65.4 grams. The shot measures 26.61mm in diameter and 18.94 mm thick. It weighs 57.8 grams. The shot measures 24.01 mm in diameter and weighs 70.1 grams. Another assemblage discovered in Worcestershire (WAW-A8D562) have some shots that exhibit the same double groove along on side. These are suggested as Musket balls. Post Medieval lead alloy shot, 17mm in diameter and weighs 26.64grams.